One of ROI Revolution’s clients in the sports and game supplies industry is a family-owned retailer that started as a husband and wife operation. The company now has an extensive network of suppliers, employees, and a massive warehouse. In 2011, They were named t o the IR Top 1000. For years, their company focused on internal marketing efforts to expand their business, but were looking to grow at a more pronounced rate. They turned to ROI Revolution as a partner to cultivate a strong online presence and reinvigorate their Shopping campaigns. 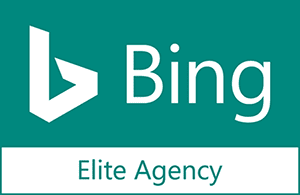 With a solid product line and an efficient, user-friendly website, ROI was confident the client could leverage Bing Shopping to their advantage and incrementally grow their business. When ROI Revolution came on board, the client’s account structure was in stasis. Their original campaigns were using only a single ad group and targeting all products with a single bid. 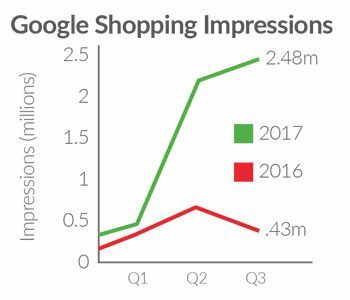 With a catalog of over 4,000 unique items, this strategy was restricting their growth potential and causing a great deal of wasted ad spend. After an initial account analysis, it became readily apparent that segmentation into several new campaigns was step one. 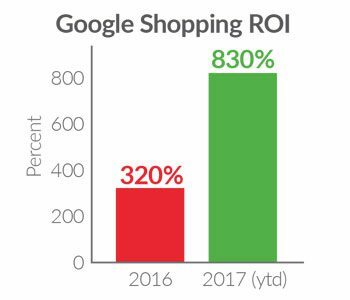 The ROI Revolution team started by separating out different product types such as pool cues, pool tables, and accessories into unique Shopping campaigns. Products are broken out into distinct ad campaigns to improve overall revenue and ROAS. By creating unique ad groups, it was easier to track products on a granular level. 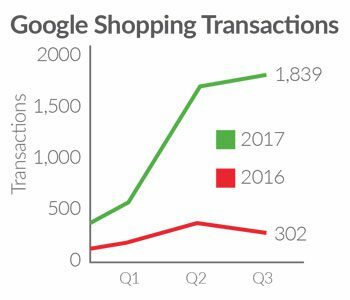 This led to a more controlled bidding strategy, as ROI analysts were able to create specific device bid modifiers for each campaign based on device performance. Our team was also able to leverage EDGE, our proprietary technology, which allows us to take organized data from a product feed and automatically builds out an account structure. This software helped the team build out the segmented product categories and turn them into ad groups in order to better control bids and search queries. This allowed the ROI team to maximize sales efficiently while greatly reducing wasted ad spend. ROI Revolution took over the account in August of 2016. 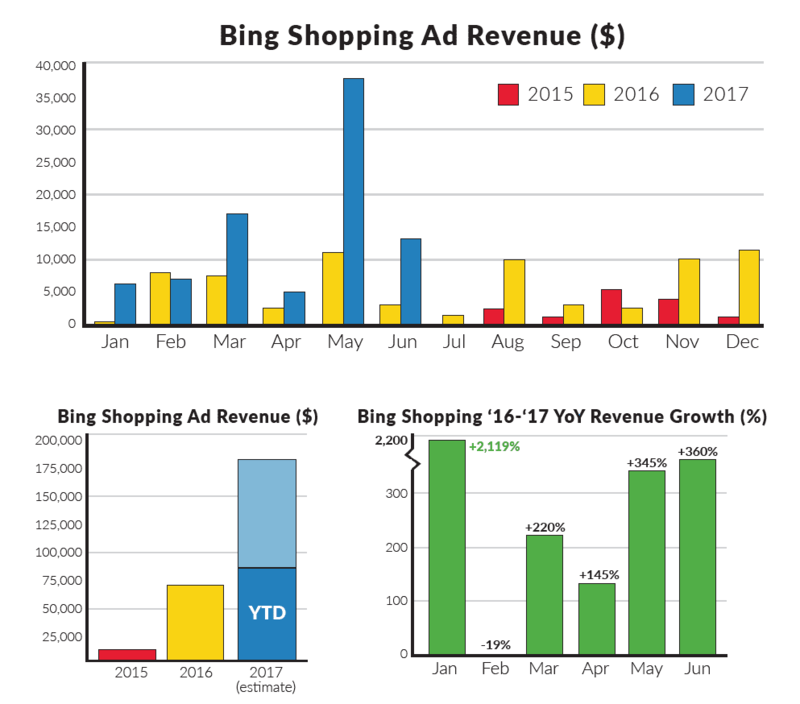 With new segmented campaigns in place, there was an immediate lift in Bing Shopping revenue. Year-over-Year gains have occurred in nine of the last 11 months, culminating in a Q1-Q2 increase of more than 250% revenue growth compared to 2016. The first five months of 2017 have already seen more revenue than the entirety of 2016! 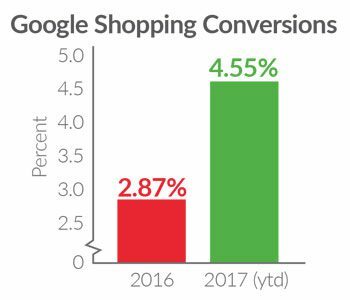 These numbers have been achieved with a linear increase in overall ad spend, exhibiting a solid return on investment and increased profits for Shopping campaigns. 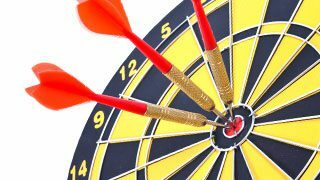 By focusing on campaign and ad group optimization, our client was able to see tremendous growth in advertising revenue will improving profitability and minimizing wasted advertising spend.